Does Cocaine Mitch have a, er, trump card to play with respect to Pelosi’s disinvitation? Senior officials are advising him that Pelosi’s suggestion is a sign of weakness — that Democrats fear he will use the stage to his advantage. It’s not known whether that is actually the case, but it is what senior officials are telling him. Lots of questions here. Like this one: Does the Senate chamber have the capacity to accommodate both houses of Congress for the SOTU? 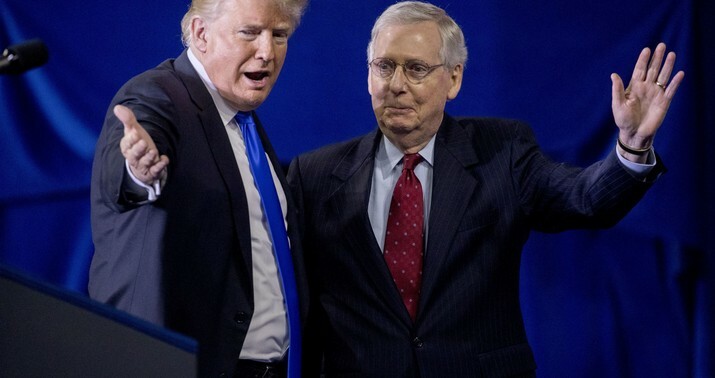 Or could McConnell commandeer the House chamber to host Trump against Pelosi’s wishes? More substantively, does the Senate majority leader have unilateral power to invite the president to speak or is that power subject to authorization by a resolution of the Senate? Roll Call reporter Niels Lesniewski says it’s the latter, which would mean Schumer could filibuster any attempt to invite Trump. Another question. Assume McConnell figures out a way to extend the invite. Would Democrats show for Trump’s speech? That answer is easy: No, not most of them. But what about those freshmen Dems from purple districts? They might want to make a gesture of respect to POTUS just to keep their Republican supporters back home pacified. It’s a cinch that Pelosi would boycott, not wanting to be trapped on camera sitting in silence as Trump harangues her for an hour about the shutdown, but that in itself would strongly signal disrespect — and would corroborate Trump’s claim that Democrats, not him, are the truly intransigent party. Would purple-district Dems pay for it? Plus, how could she boycott after claiming yesterday, completely disingenuously, that she was discouraging Trump from giving the speech due to concerns about security? If McConnell thinks it’s safe for him to attend and the Secret Service thinks it’s safe and Pelosi still doesn’t bother to show up, it’ll be transparent proof that she tried to block him from delivering the SOTU for petty political reasons. But maybe she doesn’t care. She’s gone out of her way to show contempt for Trump at every stage of this. Maybe she’d see this as icing on the cake. One more question, this one out of the box. What if Trump tweets today that he intends to deliver the SOTU in the House chamber and will be there on the 29th, whatever Pelosi may have to say about it? What does she do? No other president would publicly dare the Speaker of the House to bar him from the room to prevent him from speaking. (No other president would be disinvited in the first place.) But Trump does things the Trump way, for maximum drama. And nothing would be as dramatic as putting Pelosi on the spot in deciding whether to try to have the president physically blocked from giving an address. I assume the Secret Service would lean heavily on Trump not to follow through on that threat, just because they don’t like situations where the president’s movements are uncertain. And I also assume that Pelosi would try to avoid that game of chicken by deciding that Trump is free to come if he likes — she hasn’t formally rescinded her invite, remember — but that she and most of her caucus will skip the event. Then we’ll be treated to the spectacle of Trump addressing the nation with an empty chair over his right shoulder, with Democrats no doubt engaged in some sort of counterprogramming elsewhere for the hour. They might have to let Ocasio-Cortez deliver the Intersectional State of the Union or something. That’s the only thing that could compete with Trump. This is unspeakably petty, I hope that this seriously backfires on the democrats! Just did. Pehosi trip cancelled half hour before takeoff. RE: This is unspeakably petty, I hope that this seriously backfires on the democrats! Let’s put it this way, just as Trump’s base loves him for fighting back, the Ocasio-Cortez types of the Democrat party love what Pelosi is doing too. It remains to be seen what the non-base Americans think about this. I say he speak directly to the people from the Oval Office rather than through our dubious representation in the House, and go ahead, and send a copy of the address after the fact to her heinous. Is President Trump trying to drive his supporters away? The only thing he should hand the Wicked Witch of San Francisco is a copy of the Executive Order that immediately starts construction of the wall. Hey Nancy,the House of Representatives os the People’s House. The People elected Trump to be YOUR PRESIDENT. try to have a a little respect. Each house has plenary authority to set its own rules. That surely implies management of time, manner, and place restrictions on its own chamber. The President can't just show up and demand to be let in. McConnell can't force the House to open at his direction. The hell with that, rent out a stadium and make it an event. Fill the bleachers behind him with Angel moms. We have thousands. Have semi truck loads of cocaine bales on the stage surrounded by Marines with rifles. The Dow jumped 250 points at 2:45. Settled back down but that was pretty funny. Does the Senate chamber have the capacity to accommodate both houses of Congress for the SOTU? Schedule it, and when the time arrive have the Sergeant at Arms bar all dems, "for security reasons". There'll be enough room. Sell tickets and donate the procedes! She admits to 30 million in wealth. Let her rent a plane. Trump should do himself and the rest of us a favor and kill this monstrous tradition off once and for all. Send Congress a video address, post it on YouTube, and then hold a rally in Michigan. Well, there is a thing (much supported by the Gubmint) that he could maybe use...PBS..
After all the PUBLIC is entitled to hear him....Think PBS would deny? They are talking about McConnell inviting him into the Senate chamber, not the house. I think he’ll deliver it from the Senate chamber. Everyone in the congress will be welcome. Those who don’t show will have made a mistake. The Rats simply don’t want the people to watch the President speak the truth. The fire marshal could also ban entrance for most to the Senate. There are only 100 seats on the Senate floor, plus a certain number in the gallery.